Even in refugee camps life must go on, and when a man and a woman decide to marry the rare chance for a big celebration may be seized with both hands. In one camp in northern Iraq, beautician Rozhin Ahmed-Hussein - herself a Syrian Kurdish refugee - finds that she is rarely short of work. 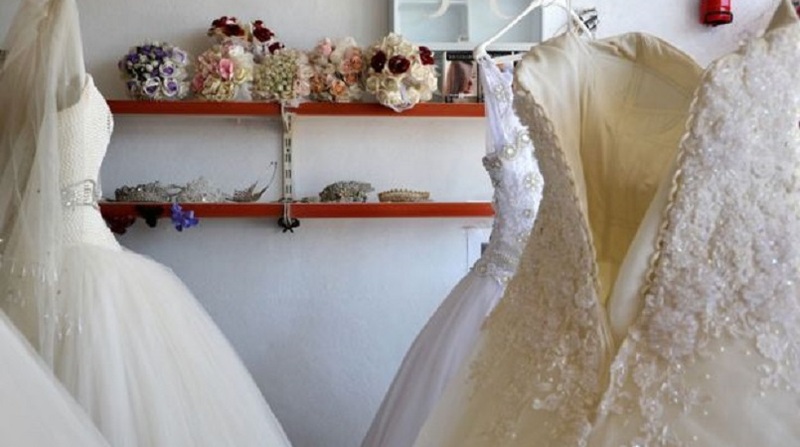 "Most of the people in the camp are poor, and Syrian refugees like me, so when I do a beautiful bride, usually I'll dance out of the door with her because I feel so happy," says Rozhin Ahmed-Hussein. A dusty refugee camp north of Mosul may not be the first place you'd expect to find a beauty salon and gown-hire shop, with frothy white frocks and diamante winking through the windows in the fierce sunlight - and slinky party dresses in vivid fuchsia and turquoise hanging from the rails. In this camp, makeshift homes are separated by vast stretches of light brown gravel paths, which kick up dust in the wind and feel hot even through shoes in the 47C (117F) heat. There are 41,000 Syrian refugees living in two neighbouring camps here. The situations they've fled from are often desperate but that doesn't stop people falling in love. And when that happens, they do what people everywhere do, they get married. Rozhin's salon isn't the only one in the camp, but it may be the most stylish. Small details, such as a coral sink placed next to a coral chair and proper reclining seats, let you know that Rozhin is not new to the business. She herself is immaculate, with no make-up. "I do make-up all day, it's like work for me," she says. Her five daughters aged from one to seven often wear matching outfits. "I like to look glamorous, I'm always like this," she says. Rozhin and her family fled Qamishli, a Kurdish town in Syria in 2012, as the civil war picked up pace. "In Syria I had a normal life, a normal job as a beautician, and then when we came here it was too hard, too tough to adjust to the environment," she says. She cried a lot, she says, because her daughter fell ill and she was homesick. "I kept begging my husband to go back, even though it was dangerous, but he refused. In time, I adapted to the situation and my daughter got better." It helped that she was able to open her business. The shop was initially a grocery run by her husband, but after it failed to make enough money, Rozhin saw her opportunity. She borrowed some money from her uncle and turned it into a salon. After spotting the demand for wedding gowns and party dresses, she started stocking those too. Now the shop has been going for five years. It's named Tulin, after her daughter. Aside from regulars coming in wanting a haircut, an eyebrow shape or a catch-up, Rozhin does up to 30 weddings a year. Many of her customers are Kurdish, and it cannot be overstated how lavish these weddings are. The two suitable halls in the camp host 300-400 guests, which is - everyone in the room jumps in to explain - extremely small by Kurdish standards. One thousand guests would be more typical, they say. At Kurdish weddings, even the guests are made up exquisitely with flicked eyeliner, I'm told, thickly applied pale foundation, bum-length hair extensions or hijabs patterned with designer logos. Because of the heat and sheer quantity of make-up needed, usually Rozhin does the bride's hair first and the make-up is done last to reduce the risk of it melting on the bride's face. Weddings usually take place at 7pm or 8pm when the air has cooled, but in the summer the temperature will still be in the 30s - which you have to factor in when the wedding make-up is as thick as face paint. Each bride takes around two-and-a-half hours to get ready, but it's not just the brides. The whole wedding party may want their hair and makeup done, and sometimes Rozhin has two weddings to do in one day. Fortunately she has friends on hand to help. The International Medical Corps runs a programme training survivors of gender-based violence to do hair and make-up, so she brings them in to lend a hand. "There's a lot of work to do with the bridal party," says Rozhin. "When I call them to come and help they're so happy - we are all sisters and we have confidence in each other. After the job is done we drink tea and coffee together." The majority of Rozhin's brides are very young. "Usually I don't ask how old they are, but from their faces they are 18 or 19 on average. "I don't know why they get married in every case, but when you're 18 years old and you're living here with your family - what else is there to do?" It also means having a big party. This is important for people coming to terms with a difficult past, and everyday refugee camp life - which means 20 people to one latrine, makeshift housing and constant vigilance against disease. "For every single woman this is one special day to have a big glamorous dress and make-up," says Rozhin. "Just one day to feel special. No-one will be hurt by this." While some brides might relish the experience of being made to feel glamorous, a mural showing a bride holding a teddy bear is painted outside the shop. It's a sobering reminder of the problem of young girls being married off to much older men - something which is particularly rampant in refugee camps. But the shop is a place for escapism, even if the women can't forget their problems altogether. "In the salon we try out new techniques with make-up, but we are always thinking about our friends and relatives." Thinking about them, and often worrying about them. Rozhin is the main breadwinner of the family. Her husband, Ahmed, finds work some days, but the next day there be no work to be had, and he stays at home. "I am the one who brings money to the family and my husband does not have any problem with this. Usually the men here don't like that, for a woman to be in charge. But he says, 'If we're getting money that's OK.'"
Business has been up and down. Having her twin girls recently meant she had to close up for a few months, allowing her rivals in the camp to pick up some of her regular customers, but now things are getting better. "There are another three that have a lot of customers," Rozhin says. Many of the families in the camp have been living here for at least as long as Rozhin has. Communities build up, neighbours get to know each other, people fall in love. Getting married means having a stake in the future, even when that future is uncertain. If you look carefully at the wedding dresses in Rozhin's shop, you can see the hems are lightly stained the same colour as the gravelly paths of the camp. How many women have worn these dresses, and made the same journey to the same hall, careful not to mess up their hair and make-up, and wondering what comes next?